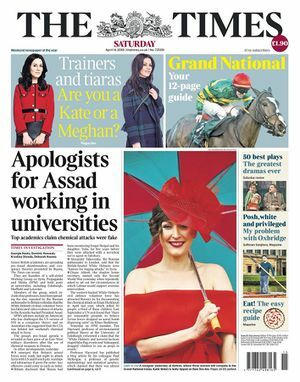 The Times front page of April 14, 2018: "Apologists for Assad"
Before the launching of the April 2018 attack, dissenting voices about the official versions of both the Poisoning of Sergei Skripal‎ and the Alleged Chemical Attack, April 7, 2018‎ in Syria, followed by the FUKUS April 14th missile attack, had made it even into some edges of the corporate media. The chemical attack on the Syrian city of Douma last weekend was a monstrous crime in which scores of civilians died. It was a violation of the most basic humanitarian norm of warfare, dating back to The Hague Convention of 1899, that outlaws the use of “poison or poisoned weapons”. Given all that is known of President Assad’s willingness and capacity to inflict harm on a captive population, it would take an extraordinary degree of credulity, sophistry and ignorance to exculpate him of this atrocity. Exactly those characteristics are exemplified by a small group of academics, on whom we report today, at respectable institutions that include the universities of Sheffield and Edinburgh. The organisation calls itself the Working Group on Syria, Propaganda and Media (SPM), and in an unintendedly perverse way it lives up to the “propaganda” part of its name. 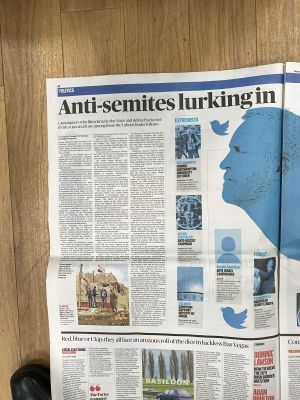 Some of the academics involved disseminate material that is wrong, unscholarly and morally odious. 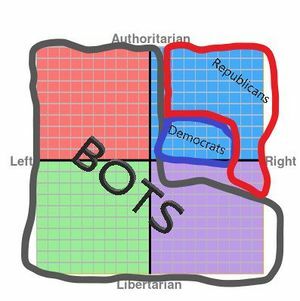 Their output is no more reputable than the conspiracy theories of the Kremlin and its online trolls. Such material is an insult to the victims of a depraved regime and a stain on the reputation of the institutions which host its authors. The leading figures of SPM’s steering committee include three professors. None has expertise in Middle Eastern affairs and all display an exaggerated willingness to entertain any idea, however improbable, that acquits the regime of Vladimir Putin and its client in Damascus of abominable acts. Noted: Ad Hominem Fallacy, on top of the list here, appears to negate the gist of the attack in the previous entry on Vanessa Beeley ? The interface between Propaganda and War: Professor Piers Robinson; Robert Stuart, Tim Hayward, Peter Ford. Vanessa Beeley. Dubious or false 'western' government claims are held up as truth. That Russia does not endorse them is proof for Russian mischievousness and its 'disinformation'. There was a stretch in April of this year where the mass media machine was cranking out attack editorials on alternative media voices who’d cast doubt upon the establishment Syria narrative, because there was so much opposition to what we were being told to believe about the Assad government that the alliance of plutocrats and intelligence/defense agencies were unable to manufacture support for a large-scale invasion. All they got out of their massive MSM propaganda blitz in April was a meaningless bombing which accomplished essentially nothing, and now the Syrian government is recapturing its territory from the violent jihadists who had seized it with western backing. Had the “think of the children!” propaganda campaign succeeded in the wake of the highly suspicious Douma incident, we would likely have seen a very dangerous and costly western regime change intervention in Syria by now. On April 14th, FCO propaganda man Andy Pryce (an associate of the Integrity Initiative) sent out a letter summarising what in his view is Russian disinformation. 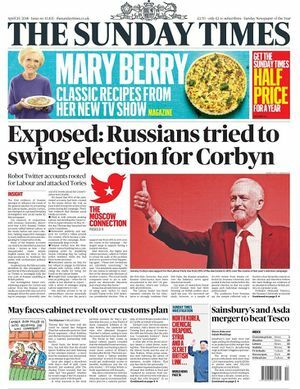 It accused Russia of faking evidence, staging news broadcasts and running an army of Twitter-bots and trolls promoting the idea that maybe the Skripals weren’t poisoned with Novichok by the Russian state. This page was last edited on 17 April 2019, at 16:51.